I woke up knowing that my family and friends were all dead. The last thing I could remember was the look of desperation on my older sister’s face as she kicked out the support that dumped thousands of tons of sand on her and the pirates trying to capture us. I thought, then, as the ceiling collapsed in a roar that I was going to die too. From the fact that I was awake, I guess I’d been wrong about that. I opened my eyes, squinting at the harsh light. My head felt, weird, like I’d been drugged. My first assumption was that I was in a hospital or something. As I looked around, I realized that I was wrong about that, too. Dreadfully wrong. I was in a cold, metal room, with a single overhead light. I wasn’t on a hospital bed or even a cot, I was flat on my back on the floor. The rust-spotted walls were almost featureless, but I could feel a rumble of machinery through my back, in contact with the steel deck. I guessed that meant I was on a ship, though it could also mean I was on a station. Either way, I supposed I was in space, which, all things being equal, was a bad sign. If I’d been rescued, they would have taken me planetside somewhere. I sat up, wincing as my head throbbed. My mouth was dry as the desert and I fumbled around, looking for anything to eat or drink. I didn’t see anything. In fact, other than the stained and dirty pants and shirt I wore, the only thing in the cell-like room was me. There was a door on the far wall, a metal hatch that didn’t have a handle on this side. I stood up, only to find my legs trembling and the room began to spin. I had to reach out a hand and catch myself, leaning on the bulkhead so I wouldn’t fall. I squinted up at the light, wondering if I could use it somehow, but it was covered over with a wire mesh and that was welded to the ceiling. I didn’t have any tools and this wasn’t like one of the entertainment modules I’d enjoyed as a kid. I wasn’t the plucky kid hero who’d outsmart the pirates and get back home. After all, I didn’t have a home anymore. My family was dead. The realization hit me again, this time like a physical blow. I sagged against the wall, sliding down until I was seated on the cold metal deck. I brought my knees to my chest and wrapped my arms around them, in turn. I put my head down and fought back tears. This wasn’t fair. This wasn’t right. I wanted to see my dad. I wanted to see my mom. I even missed my bossy older sister, who at least had been less obnoxious since she started at the Academy. I’d never see any of them ever again. They were gone. The pirates, the same ones who’d locked me in here, had killed them. My mother, my father, my sister, they’d all died fighting. Here I was, still alive. It wasn’t fair. Who said life is fair? My internal voice sounded an awful lot like my older sister or possibly my mom. I let out a shuddering breath. What had happened had happened. Fair or not, that didn’t come into it. The pirates who’d killed my family, they had me as their prisoner. I might not be the hero in an entertainment module, but I could still try to escape. And even if I couldn’t escape, I owed it to my parents, to my sister, to all the people at Black Mesa Outpost to at least try to escape, to bear witness, and to do what I could to bring these hocking pirates to justice. Despite the chill of the room, I found my rage was sufficient to keep me warm. I was ready when the door opened. A tall, skinny boy came through the hatch, holding a tray. I lunged for him, but I was still pretty weak and I wasn’t as fast as I would have liked. He saw me coming. He let out a girlish shriek and dropped the tray. “Don’t hurt me!” He flinched back against the wall. That was strange enough that I froze, staring at him in confusion. “Who are you?” I demanded. “Well, that’s just great,” I muttered. I looked from him to the door, which had slammed shut behind him. A slot opened on the hatch and I got a brief glimpse of eyes, then the slot slid closed. Apparently they didn’t care what happened here. “I’m no man’s slave,” I rejected the very thought. I stumbled away from him and my back hit the wall behind me. I slumped down, staring at Ted in a mixture of shock and horror. “How long have you been here?” I asked finally. “Jiden is still alive?” Ted shook his head. “That’s amazing… but they thought I was dead?” His expression fell, “Oh, man, my parents… gosh, I can’t imagine what they’re going through.” He let out a little sob, “That explains why no one ever came looking for me, I guess. Everyone thought I was dead…” He sat back, looking stunned. “It’s okay,” I said. “The authorities will know what happened at Black Mesa Outpost. They’ll…” I trailed off then, as I realized that there wasn’t very much they could do. If we were on a station or ship, then we could be anywhere. “Where are we?” I asked. “He has a few of them,” Ted shrugged. He rubbed at his face. I thought he was wiping away tears, but I didn’t say anything. I couldn’t imagine what he’d been through in the past few years, a prisoner to pirates who’d threatened to kill him. He sighed, then, and stretched out on the deck, reaching for the tray he’d dropped. On his hands and knees, he picked up the tray, then the overturned bowl and the two cups on it. I watched in confusion as he carefully scraped what looked like gruel, off the floor and back into the bowl. “Want something to eat?” Ted asked in resignation. “That’s our food?” I asked in shok. “Us?” I asked, staring at him. The tiny bowl seemed inadequate for one person’s meal, much less two. “Yeah, they aren’t too happy with you. They said I could share my food, if you woke up, but I think Vars really doesn’t like you,” Ted sighed. “Not that he likes anyone, but I guess Wessek put him in charge of capturing you and some others, and I overheard that Vars only got you, so…” Ted shrugged. “So Vars is in trouble with his dad, that’s good, right?” I asked. My throat was screaming at me to remind me how thirsty I was and my stomach rumbled, telling me I hadn’t eaten in weeks. I moved over and sat across from Ted. I took the other glass of water. Like the other stuff on the tray, it had mostly spilled. There was a tiny bit of water left in the flimsy plastic cup and I sipped at it. It had a harsh, metallic taste, like it had been through a recycler too many times. I didn’t care, not just then. I let the water soak into my parched mouth and then took another sip, fighting the urge to gulp it down in a single swig. “Don’t need to tell me twice,” Ted muttered. He slurped the whole bowl down in a single motion, then held it up to get the last little drops. “It doesn’t taste good and it’s not very filling… but it’s all we get.” He gave me a weak smile. I hadn’t even met Vars and I already hated him. “Tell me about Wessek, and the ship, and any of his personnel you know or have dealt with,” I said. “Why?” Ted asked. He inched away from me and put his back against the wall, staring at me with dull, tired eyes. “Because, maybe we can use that information to escape,” I fought the frustration down. Ted was my only resource, I couldn’t afford to get him angry with me. For that matter, he’d been through a lot in the past few years. I couldn’t judge him based off how he was now. Those words tasted like ashes in my mouth, though. I didn’t have a home, or a family. Not anymore. “Wait, what?” I demanded. The Enforcers were Century’s police force. They had authority over stopping smuggling and criminal endeavors like piracy. “Okay, so where are we going?” I asked. “I don’t know,” Ted admitted. “Sometimes Wessek visits some of his other bases. Sometimes it takes weeks or even months. We might be doing some kind of raid or attack.” Ted shuddered. “I really hope it’s not that, Vars always comes back and brags about how many people they killed.” I got the feeling that Vars terrified Ted even more than Wessek. At this point, I was honestly surprised that Ted wasn’t crazy. Maybe he was tougher than he looked. “These bases, what are they like?” I asked. “How do you know they’re airless?” I asked. That didn’t sound promising. “No bases in cities or inhabitable planets?” I asked. Someplace like that, maybe we could escape and find some way back to Century, at least. I didn’t know what to say to that. I remembered a little of what Jiden had told me about Ted. He’d been cheerful, helpful. I hadn’t paid much attention, beyond remembering how sad she looked, thinking about the friend that she’d gotten killed. Only he wasn’t dead. He’d been here, trapped, working for a pirate who regularly threatened to kill him and had him beaten when he stepped out of line. 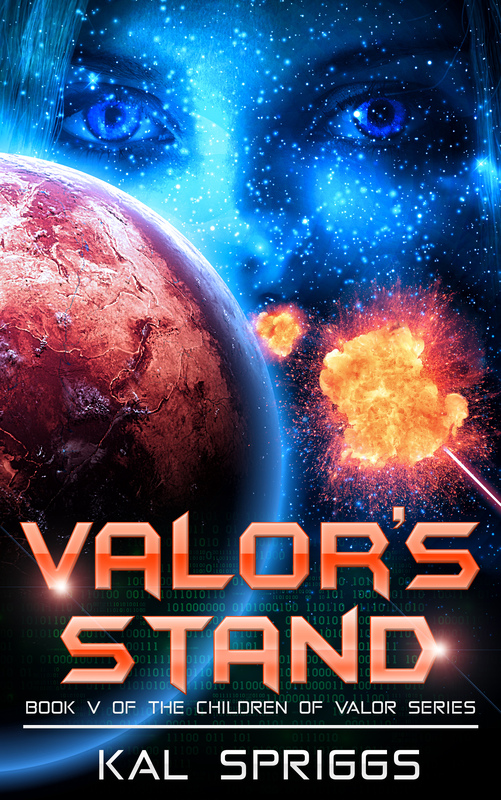 I’m excited to announce the release of Lost Valor, coming on 14 December to Amazon. Check back here next week for the first snippets! 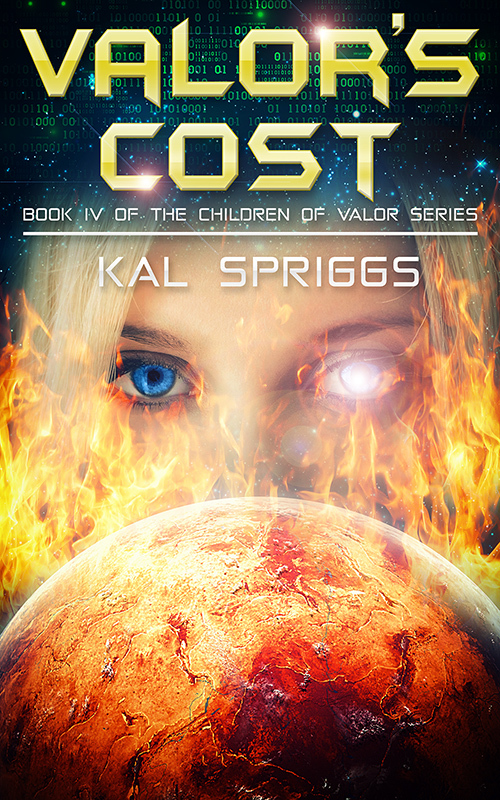 Lost Valor is the first book of the Forsaken Valor series, a spin-off of the Children of Valor YA series that follows Jiden Armstrong’s little brother, Will Armstrong. They say that without the dark, we would never see the stars, without losing the light, we can never truly see it. Well, I’ve lost the light, I’m in a dark place, a forsaken place. My name is William Alexander Armstrong. Pirates took everything from me: my possessions, my freedom, and the lives of my friends and family. But I’m not going to let them take my drive. I’m going to escape, I’m not going to stay trapped, working as their slave. I might be lost, I may be forsaken, but I will find my way to freedom, and when I do, I will bring fire and destruction on those who took everything from me. Valor’s Cost is out today! Jiden Armstrong has seen death and destruction, visited upon people around her. She has spent the past three years attending the Century Military Academy in the hopes that she can protect her people. Now, though, she has lost those most dear to her. Worst of all, the people who did it were coming after Jiden. She’s going to have to rebuild her life. Jiden will have to fall back on her friends and her family to recover. She’s going to have to find a new reason to live and come to terms with her losses… and her enemies haven’t given up. To them, Jiden Armstrong is another pawn in the game… one that is inconveniently placed. They’re going to keep coming after her so long as she stands in their way and if Jiden can’t stop them, then the people paying the cost of Jiden’s valor may well be those closest to her. Since there’s some rather… impactful events that happen in the first chapters, I will not be snippeting Valor’s cost. But it will be out and live on 28 September. Mark down the date!